One common option for connecting a camera or other device in a remote location on site was to run fiber directly to the camera from the head end. Typically, this required the far end device to have local power installed. If local power was not already existing, electricians were needed to install it, making the addition of a device in this location more costly. One recently released product, Berk-Tek's OneReach system, is aiming to eliminate the need to install high voltage at the device location. OneReach consists of a power injector, a hybrid fiber/copper runner cable, and a breakout box with PoE port at the far end. The powered endpoint supplies one or more PoE ports, drawing power from the copper in the runner cable, and data via the fiber. This setup eliminates the need for high-voltage power at the far end of the run, potentially providing savings when compared to having AC power installed in these locations. It also eliminates the need for specialized skills to terminate the fiber cable, since the runners ship pre-terminated. The OneReach system does add some cost compared to standard fiber cable or the other options examined herein. PoE injectors and remote units can be found for $689 online, with one required on either end. The cost for the runner cable will vary widely, depending on length, termination types, copper wire gauge, and fiber type. Total cost is likely to be $1,500+. Though it is expensive, OneReach does support PoE at distances far greater than other options, with a maximum distance of 3,850', meaning it may be an option where PoE extenders or ethernet over coax is not. It also is the only option which adheres to all cabling standards, making it attractive for some users with those concerns. PoE extenders such as Veracity's OUTREACH or Nitek's EE328 are the second option. 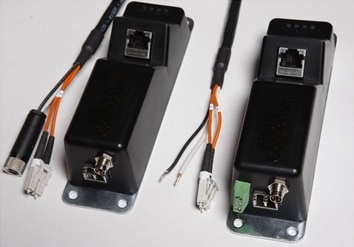 These units are installed in-line in a run of UTP cable, and boost the distance at which PoE can be supplied, up to a maximum of 1,500-2,000 feet with some units. Both interior and exterior versions of some of these devices are available, to fit different installation environments. PoE extenders are intended to be simple to install and plug-and-play, requiring no configuration, but simply plugging in cables in either side. One potential drawback, which may be of concern to some users, is whether cabling topology for these units is standards-compliant. The BICSI TDMM calls for all ethernet cables to be terminated to a patch panel at one end, and a jack at the other. Inserting PoE extenders between 2000' of cable obviously does not meet these standards. Some leeway has been given for direct connection of cameras, recently; that is, terminating the camera end of the cable with a mod plug instead of a jack and patch cord. So, we would expect that allowances may be made in the future for units such as these, as long as each of the individual cable segments are terminated and tested. PoE extenders can be found online for about $150-200. The third, and probably least thought-of option, is Ethernet over coax. Numerous manufacturers, such as Nitek, NVT, and Veracity (probably the most popular) provide units which allow Ethernet and power to travel over a single RG-59 coax cable. Usually these are used for installing IP cameras where analog cameras were previously installed. However, with some units providing power over the cable over a thousand feet, Ethernet over coax becomes a viable option for remote cameras up to about 1000' away. Ethernet over coax may be especially attractive to some, considering traditional analog installers would likely be more comfortable terminating RG-59 cable with BNC connectors than they would be terminating fiber or even RJ-45's. One question which comes to mind is how to lightning protect outdoor cable runs using this technology. Since most video surge protectors are rated for use with composite video, which is normally about one volt, they will not function with coax carrying PoE power, usually 48V or more. Some cable TV lightning arrestors may be rated for these voltages, however, and provide proper surge protection. Ethernet over coax converters can be found online for about $300. Which technology is preferable depends mostly on distance. Below 1000', Ethernet over coax is a viable solution, and simple to install. Between 1000-2000', PoE extenders come into play. At greater ranges, fiber may be the only option. One factor to consider when using PoE extenders, however, which need not be considered otherwise, is where to physically locate the extenders which are installed in the middle of the cable run. Preferably, they would be in a serviceable location, for ease of future troubleshooting. However, this is more likely to subject them to tampering and vandalism. If the cable is to be installed outdoors, locating these units may be an issue, and this should be taken into account.